As the overall construction sector added 151,000 jobs year-over-year between March 2013 and March 2014, the highway and bridge-specific construction sector grew as well, based on the latest data from the U.S. Bureau of Labor Statistics. 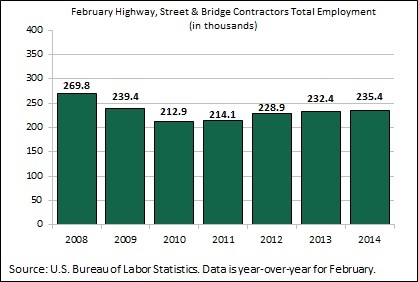 The highway and bridge-specific sector increased employment by 1.3 percent (a gain of 3000 jobs) in February 2014 compared to February 2013—sector specific data is always delayed by one month. The overall construction sector’s unemployment rate was 11.3 percent in March 2014—well above the national average of 6.7 percent.